So you've done the hards yards and designed a roleplaying game that works, and now you're in the process of writing up the manuscript with an eye towards self-publishing? It can take a fair bit of extra work to whip a manuscript into shape, ready for the layout process. As a layout artist, I expect to do a certain amount of reformatting when I receive a manuscript, but if you compose your manuscript with the following tips in mind you'll likely make your layout artist's job a bit smoother and they'll thank you for it! You might even be able to negotiate a lower rate for the job. Please note, these are general tips based on my experience doing freelance layout work. This is the way I like to get manuscripts, and while many tips may be generally applicable, I can only guarantee that I find them useful for importing manuscripts into InDesign CS6. If in doubt, my best advice is to check with your layout artist to find out how they would prefer to get stuff. This is a pretty long post, and I'll add to it if I think of any new advice or hear any tips from other designers. Hit me up in the comments if you have any feedback. Finish editing before layout, and supply the whole manuscript at once if you can. Don't use blank lines between paragraphs, or use tabs to create indents. Use paragraph styles, especially for headings. Also use them to flag other types of text if you like. Use [[tags]] to flag special text areas such as sidebars and tables. Optionally, use character styles for bold and italic words in otherwise normal paragraphs. Use your word processor's tables, or just use plain text with line breaks between rows and tabs between columns. Your layout artist may spot a few typos here and there and clean up a bit of messy formatting, but generally speaking, layout comes after editing. It's OK to provide a bit of unedited sample text in order to help the design process along when you're getting the book design set up, but when it comes down to the actual book layout, you really want to have the text as polished as possible. Layout artists spend a lot of time and effort juggling and balancing text with images, tables, and sidebars, while making sure page breaks are in good spots. This sometimes involves a little "massaging" to make it so everything will fit perfectly on a page. In some cases, even adding, removing, or changing a single word at this stage can throw off the whole design and cause problems to cascade through the rest of the chapter. As much as possible, finalise your manuscript before proceeding with layout. If you want your game to be an evolving digital document, this can be tricky. In this case, let your layout artist know that you want to be able to modify the document in the future. There's always a tension between solidly filling every page or trying to ensure that important concepts aren't split across pages. If your artist knows you need flexibility, they won't have to be quite so determined to nail everything down perfectly. If you can't afford an editor, wait a few weeks from when you finish the writing and then read through the entire thing yourself from front to back. Try to persuade some of your friends and gaming buddies to look over it as well, although I know that can be a hard ask. If you're running a Kickstarter, you might find some of your more enthusiastic backers are keen to go over the early manuscript with a fine-tooth comb. Try to provide the entire manuscript at once. It's easier to import a single large document into InDesign than several separate chapter documents, because the settings need to be checked for each import. Often once it's imported, the text will need to be processed to format it correctly; if it comes in as several documents, possibly at separate times, then that processing will have to be repeated. Paragraphs basically come in two flavours: those with a blank line between each paragraph, and those with an indented first line (sometimes also without an indent for the first paragraph after a heading). In InDesign, indents and the space between paragraphs are built into the paragraph style. In other words, the white-space is added automatically. Don't add blank lines between your paragraphs, because your layout artist will likely have to go through and manually delete them all. I know it's a bit strange at first, since you have to manually add a blank line for most writing on the web (like I'm doing with this blog post). Instead, try editing the Default or Normal Text paragraph style in your word processor so it adds 3mm/0.1" after each paragraph. In Google Docs, click on a normal paragraph, select the Line Spacing button and choose "Add space after paragraph". Then click on Styles, then the arrow to the right of "Normal text", and choose "Update 'Normal text' to match". Likewise, don't use tabs to create first-line indents, because they'll have to be manually deleted. You can modify the default paragraph style in most word processors to automatically add a first-line indent (look for an "Indents and Spacing" option), although I can't see a way to do it in Google Docs. In any case, you can always use the above paragraph spacing option when composing, and just tell your layout artist that you want to use first-line indents. To make a manuscript easy to import into InDesign, nothing beats paragraph styles. InDesign relies on paragraph styles to make sure the formatting is consistent throughout the document. In addition, say you decide to change a heading font. Without paragraph styles, you'd have to trawl through the document and manually update each heading (or perhaps use a "find-and-replace style" function, although that may cause its own issues). With paragraph styles consistently applied, you can simply edit the style settings and the whole document will automatically update. Here's the cool part for layout: When you import a document into InDesign, you can map any paragraph styles in the source document to styles you've established in InDesign. Assuming the layout artist has set up the basic layout design ahead of time, this means a lot of the basic styling is applied automatically. Without this, the layout artist either has to go through the book alongside the original manuscript and manually apply the right styles, or else they have to go through the original manuscript and pre-format it before importing. Both options are time-consuming and risks missing things. This is something I expect to encounter, and you may consider it part of the layout artist's job. Just don't be surprised if they want to charge a bit extra to cover the pre-formatting work. Use paragraph styles, and use them consistently! You can create custom ones, but most word processors will likely have some set up that you can select from a drop-down menu. At the very least, you should apply paragraph styles to your headings. Generally you'll have chapter headings, section headings, sub-headings, and maybe even minor headings. Use Heading 1 for your chapter headings, Heading 2 for your section headings, and so on. This is good advice even apart from the layout potential, because you can often use heading styles to automatically generate tables of contents, which may aid your development process. You can create custom paragraph styles to flag other special text. This tip can be a bit tricky to get your head around. Think of paragraph styles as different colours of paint. When your layout artist imports the document into InDesign, the program basically looks for the different colours. 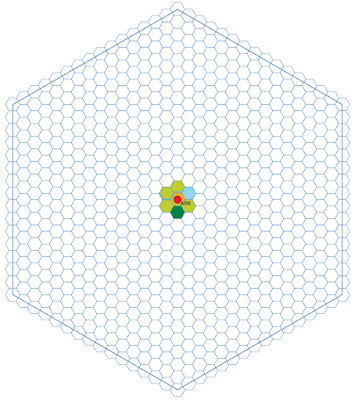 Anything blue becomes a chapter heading, anything green becomes a section heading, and so on. The thing is, anything that hasn't been painted effectively becomes plain text when it's imported. The main culprit here is bullet lists and numbered lists. They look like they have a style applied in your word processor, right? — it's a bullet list, after all! But import it, and more often than not InDesign will treat it as plain text. Same for numbered lists. This means your layout artist may need to go through and manually apply bulleted and numbered list styles. Again, applying paragraph styles is the solution, and prevents your special formatting from getting dropped when it's imported. You create a new paragraph style in your word processor called "bullet list" or "list" or whatever. You can probably select a line from such a list and select "create new style from current selection". If you have different levels of bullets, I highly recommend creating a separate style for each level. Then, go through and apply those styles to all your bullet lists. They won't look any different, but if you click on them you should see the custom list style in the menu bar, rather than "Default" or "Plain text" or whatever your normal text style is called. You can use this trick for all the other special text you have too, such as examples, quotes, sidebars, and more — even for table text, but see below for more table tips. An indented italic paragraph in your word processor will just look like plain text to InDesign unless you "paint" it with a paragraph style. This tip is a bit more difficult in Google Docs since, apart from normal text, all of the paragraph styles are called "Headings". Pro Tip: You can set up your different paragraph styles so they appear as different colours (black for normal text, blue for examples, orange for sidebars, or something). This acts as a handy visual aid so you can easily see where formats have been applied and where they may have been missed. Quite often I encounter manuscripts that use ALL-CAPS for the headings. It's understandable: even in a plain text file, it's a quick and easy way to make a line stand out as different from the surrounding text. Here's the thing. InDesign references headings when generating the Table of Contents, PDF bookmarks, running headers and whatnot. If the source text is literally typed in as all-caps, then you'll end up with contents and bookmarks that are SHOUTING AT YOU. If you actually want all-caps headings in the book, your layout artist can set up heading styles that automatically turn the headings into all-caps. This preserves the standard "Title Case" formatting in the background, which then gets pulled for the ToC and such. Using all-caps isn't normally a huge hassle, but it can become a bigger issue when it needs fixing in very long manuscripts. There's a workaround, but you may end up with "A Capital At The Start Of Every Word" instead of "A Capital at the Start of Important Words". Use Title Case for your headings (and elsewhere). If you want the headings to be all-caps in the finished product, just let your layout artist know. And if you'd prefer to compose your document with all-caps headers for the look and feel of it, I suggest seeing if your paragraph style settings will allow you to make headings all-caps automatically. Another way to mark out special text and make sure it's not missed is to use tags — for example, calling out an example by putting [[EXAMPLE]] before the example text, and [[/EXAMPLE]] at the end. This is particularly useful for calling out "floating" sidebars and tables that will exist outside the normal text flow. The layout artist will search for these tags and extract the text, turning it into a sidebar or whatever and deleting the tags. Choose a distinctive way to call out tags, and use it consistently. Unusual combinations of punctuation are usually best, because they're easy to search for and won't appear in general text. [[Double square brackets]] are a common choice. Use the same bracketing for all your tags, regardless of whether it's a [[SIDEBAR]] or an [[EXAMPLE]]. If you use tags for stuff like examples, and maybe even bullet lists and such, then you don't need to worry about using custom paragraph styles for them. Using tags is better than just using word-processor formatting to distinguish different sections (such as indents and italics), but it's not as good as paragraph styles. Paragraph styles rock, and you should definitely learn how to use them if you don't already know. You can think of character styles an exceptions to the basic paragraph formatting. So this is a basic paragraph, but this bit has an italic character style applied. When you import a document into InDesign, character styles sometimes come through and sometimes fall off, much like bullet lists. Even when they do come through, if they aren't attached to a character style, they can easily fall off during general text processing. There are work-arounds for the layout artist, but they can be a bit fiddly and may cause other issues. This is really an optional step, but if you use a lot of bold, italic, or bold-italic text for emphasis, you might consider setting up character styles and applying them to your bold, italic, or other unique text when it appears in otherwise ordinary paragraphs. There's no need to apply "bold" to all your headings, though. Just apply character styles whenever they are an exception to the surrounding text. If it's not supplied in the right format, information in tables can be fiddly and require close attention to detail. But when information is supplied correctly, tables are a breeze. There are two options for tables. You can just use your word processor's tables to format your information. Don't worry about making them look pretty; the main thing is that everything's in the right place. When they're imported into InDesign, the designer can just change the table and cell style settings to format everything nicely. The other option is to use plain text: put a carriage return at the end of each row, and separate columns with tabs (you don't need a tab before the start of the first column). It doesn't matter if the columns don't appear to line up visually; they will do once the text is converted to a table. If you go with the plain text option, I strongly recommend flagging the tables with tags as discussed above. Very optionally for both options, you can also use custom paragraph styles to flag table text. I use five styles for most games: Table Body Left/Centre (sometimes also Right), Table Heading Left/Centre (for the column labels), and Table Title. Doing this at the manuscript stage is going the extra mile for your layout artist, and it's not something I would expect a client to provide unless they were tremendously keen on pre-formatting. That's everything for now! Did I miss something? Any questions, comments, corrections, or suggestions? Let me know in the comments and I'll see what I can do. I love my job! As an RPG freelancer, I get to work behind the scenes on a lot of great new products. At the moment, the jobs are coming thick and fast, which is great — but the flip-side is, the more work I have the less time I have to work on my own projects. 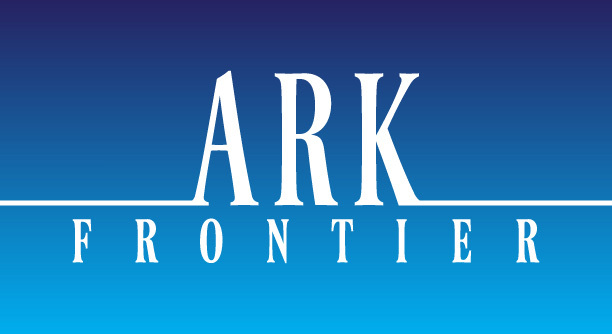 Hence the lack of blog posts for the past month or so; I simply don't have anything new to say about Ark Frontier at the moment. So, to the extent that I'm able, I thought I'd talk a bit about my current freelancing projects. The main one that's taking up my time is a very large art job. I've signed on to create about a hundred images over the next three or four months, so I'm having to make sure I keep to a production schedule in order to get it all delivered on time. I'm also still working on the cover illustration for a spin-off of Evan Paliatseas' MASS RPG. There's a lot going on in the picture, so it's taken me a while, but I finished rendering all the characters today. Now I just need to complete the background. I'm working on a couple of projects for Johnn Four of Roleplaying Tips. One book is now in the final stages after a few months of prep-work including editing, collating, and formatting. I'm currently proof-reading some adventure-building course content, so I'm paying attention to any tips I can glean from that, that I might be able to apply to Ark Frontier or any other scenario products I create. There may also be some additional layout work on the horizon from Johnn, which would be great! Speaking of layout, I've been in negotiations to do the layout for several games. Most of them are probably a bit early to announce, but one of them is the new Spellbound Kingdoms: Arcana supplement, which is currently on Kickstarter! It's going great guns, so if you're a fan of the game, you should go check it out. I set up the preliminary layout design about a year ago, and it's finally coming to fruition. I've also recently done a bunch of little jobs: character sheets for WRAITH (where you play the members of a COBRA-like bad guy organisation) and Finding Haven (a solar system sci-fi game I did a map for a little while ago), and a map for Rebirth. I've also started work on a small one-off art commission, but that's not urgent. As you can see, I'm keeping very busy! Hopefully I'll manage to knock a few of these projects down and free up some more time to muse and tinker on my own stuff too. 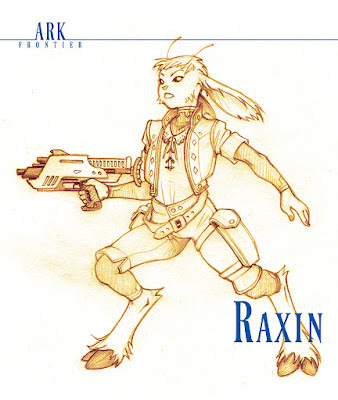 I've recently created a design I'm happy with for the raxene (singular raxin), one of the two playable nonhuman species in Ark Frontier. This has evolved through a few rounds of sketches. 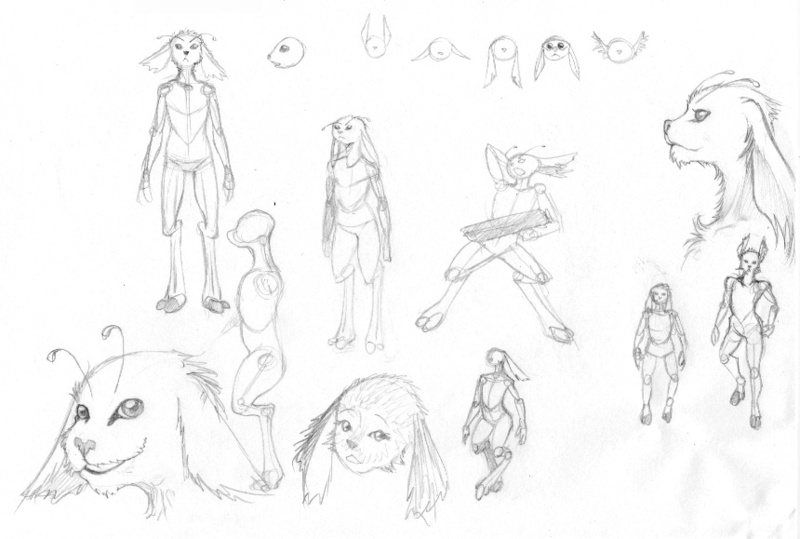 My initial concept was of humanoids covered in short fur. I was tossing up between human-like plantigrade legs or more animal-like digitigrade legs; in the end, I went with digitigrade legs ending in hoof-like pads. This feature, and their species name, is inspired by the real-world hyrax. As you can see from the first sketches below, I was originally experimenting with a muzzled face, but the image I really had in mind was closer to the flatter human-like face shown in the bottom centre. However, I wasn't entirely happy with the look of that sort of face and head entirely covered in uniformly short fur. 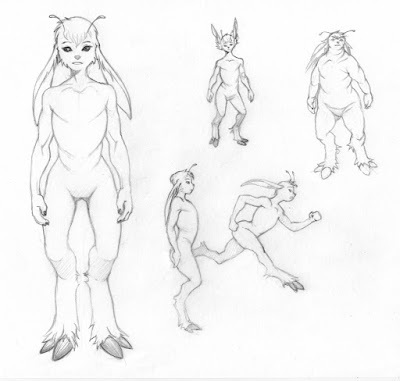 There's a fine line to walk when coming up with an "alien" species, between creating something that readers can relate to, and avoiding just making a funny-looking human. To that end, I've given the raxene a combination of unusual features. They appear mammalian, being furry with rabbit-like ears, but also whisker-like antennae and hoofs. In addition, the females lay eggs which hatch well-developed young, so they don't breastfeed. In this next round of sketches, I worked out the proportions of the legs (I'm not an expert at digitigrade legs on humanoids) and other body features, and experimented with motion and body-types. They have a fairly rotund egg-shaped torso. I got around the uniform face-stubble problem by introducing a short tufty fringe. I've made sure there's a wide range of possibilities for individuality — different ear shapes and positions (floppy, raised, swept back...) and different fringe styles are the obvious ways to distinguish individuals, aside from face-shape and build. I have considered giving them Acrobatics +1 instead of or as well as the Avoid bonus, since Acrobatics would increase their utility as explorers, but the Avoid bonus gives them an edge in combat that makes up for their reduced Strength. If I want to include Acrobatics as well, I'll need to come up with some other penalty. Apart from the features already described, raxene are notably swift and agile. They evolved from herbivores whose main defence was outrunning their predators. They are slightly smaller than humans on average. There's very little distinction between the sexes, except that mature females have wider hips. They lay largish eggs only when fertilised, which take a few months (probably three?) to hatch. The young can eat soft foods straight away, and grow rapidly. They are soon able to move about on their own. Before the Phantom Storm, the raxene and vaion formed Aratene society together. 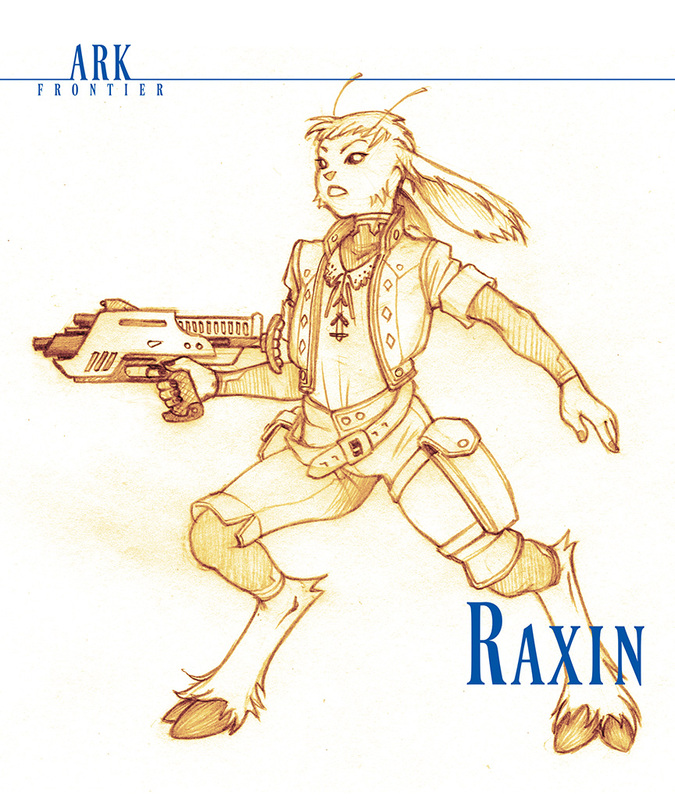 Due to physiological differences there are roughly twice as many raxene as vaion, and this often leads to the raxene being viewed as the "default" in Aratene society. Raxene are traditionally seen as builders, farmers, warriors, and other physical occupations, although stereotypes are frequently broken. Raxene have an ingrained respect for eggs and nesting sites. Nests themselves are sacrosanct and can only be entered with permission. There's an order of egg-priests who visit nests to check on the eggs and advise families, and indeed the egg is a sacred symbol in Aratene culture — a symbol recognised by the vaion too, even though they don't lay eggs. A small group of egg-priests have begun preaching that the Ark itself is an egg, from which the children of Arat are about to hatch. Arat isn't a monoculture, although the Phantom Storm means that mostly members of the local egalitarian culture were rescued by the Ark. Given the relative similarity between the sexes, and the sacred role of the egg, it's likely that several nearby societies were matriarchal in nature and perhaps held eggs in even higher regard. Unless pockets of refugees have somehow survived for the past 18 years, though, it's also likely that most such cultures have been wiped out. I'm still working on the design for the vaion. I know I want them to be a unisex species, but I've yet to figure out how they reproduce. They also have a connection to Arat's magical field, meaning they are at once skilled in manipulating magic but also vulnerable to it. Way back in 2015 I posted about the way Size would be handled in the PowerFrame Core Rulebook. While the numbers work, I've never been totally satisfied with the "floating modifier" solution. I had tried several ideas, and the one I settled on had the least amount of weird stuff being juggled on the character sheet. An earlier version had you track "weapon level" and "total level" for five or six specific Abilities, which was a bit of a pain, and difficult to explain. While the current implementation of Size does work, it tends to be fiddly because you have to constantly consider Size Differential and remember to apply it in the right situations. Unfortunately it’s not possible in the current system to just incorporate Size into the affected Abilities directly, because of the way weapons use different Abilities — you end up with large characters being super-accurate with axes, and tiny characters doing huge damage with flails. 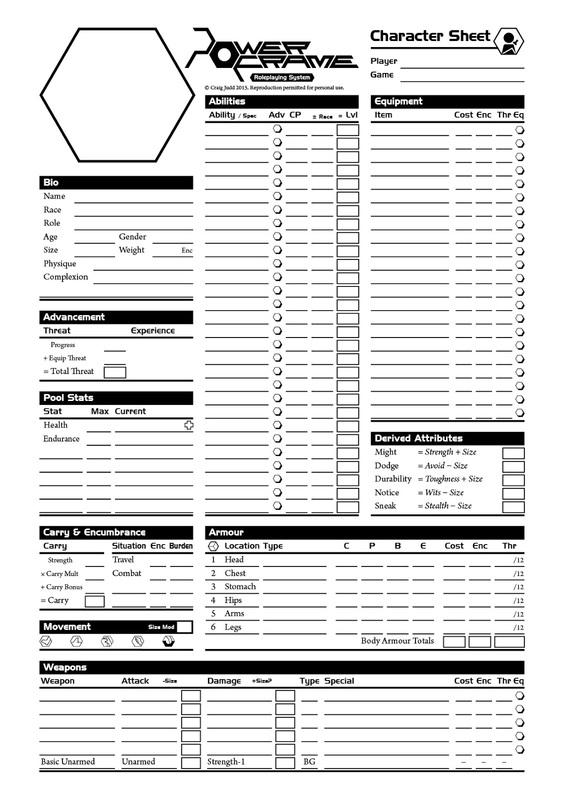 Recently I reapproached the idea of recording extra values on the character sheet. Rather than incorporating Size directly into Abilities, or having it act as a floating Modifier that needs to be applied when relevant, we instead create derived Attributes that can be written on the character sheet and used consistently. Each character has these regardless of Size, although for Size 0 characters they will be the same as the basic Ability. Always subtract Size from Attack. This value can be recorded in the Weapon section. Only add Size if Damage is based on an Ability. Always add Size when resisting Damage or other Physical Effects (forced movement, flashblindness). May sometimes be based on Strength, Wits, or some other Ability. Spotting hidden objects and characters. Use unmodified Wits for Initiative. Hiding or trying to move stealthily. 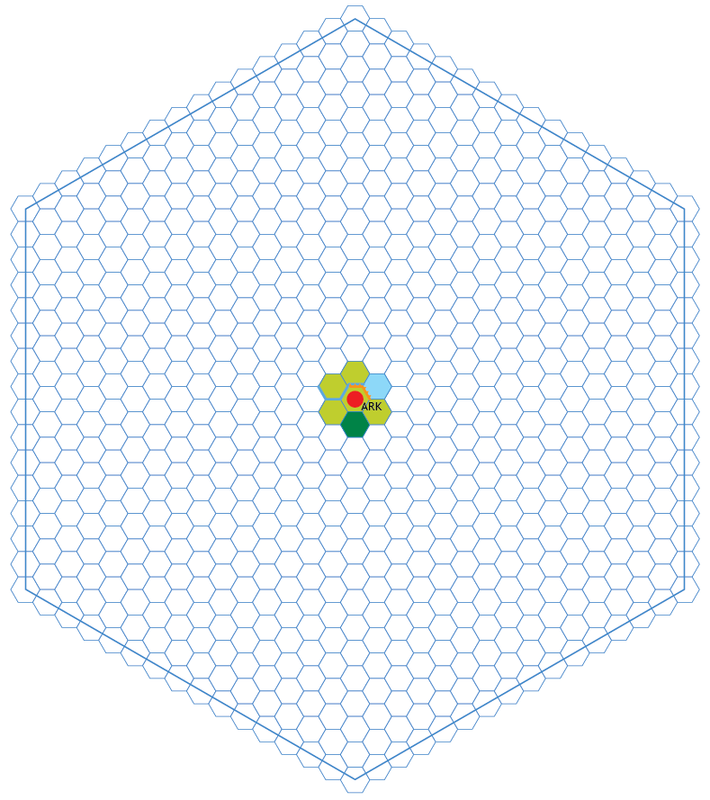 Each point of Size adds half a Hex of Movement to all Movement Types as normal. The Derived Attributes replace the listed basic Abilities for the noted functions. The basic Ability Levels are used for basic Attack and Damage values, and to determine minimum and maximum values. For example, a Size 2 character can buy Wits like any other Ability, and puts 3 points into it. They then have a modified value on hand for rolling to Notice things (3-2=1), while keeping the basic value for rolling Initiative (3). We can also use the basic value to work out the correct values for Attack (3-2=1) or Damage (3+2=5) rolls that use Wits, or to calculate Durability (3+2=5) against flashblindness. 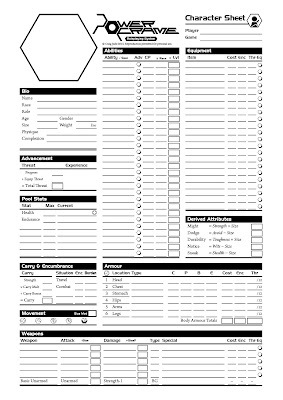 I also created a revised character sheet — here's a preview, but I'll likely upload a PDF version to the product on DriveThruRPG once I get some feedback. The extra stats ate up a bit of the Equipment list, but I was also able to remove the footnote from under the Weapon list. The reason I've been thinking about Size lately, is because I've been designing the power armour for Ark Frontier. The colony has a few dozen suits, across three different models. All the exo-suits are under the control of The Line, charged with maintaining colony defence. Pioneer class are light person-sized (Size 0) hardsuits, designed for reconnaissance and combat support. Vanguard class are nearly 3 metres tall (Size 1), designed for front-line combat. Destiny class are nearly 5 metres tall (Size 2), designed for defence and heavy assault. I think that using pre-totalled Derived Attributes will make it a little easier and more intuitive to handle power armour. Also, many of the Phantoms in Ark Frontier will be smaller or much larger than people, and it would be nice to be able to supply the final total stats in the creature write-ups. If you've read or played PowerFrame, especially if you've had to deal with Size, I'd love to hear your thoughts! I don't think there's many better ways of handling it without stripping back the whole system and starting again from scratch. 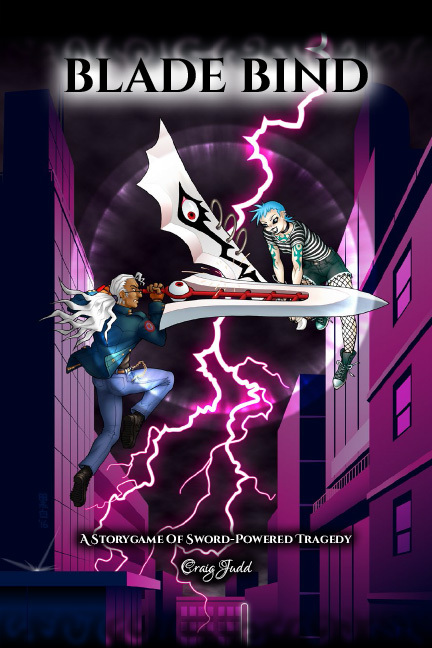 Blade Bind is part of the current Anime Blast Bundle of Holding, which runs until June 26th. This is a great opportunity if you haven't picked up a copy yet, and a percentage of the profits even go to Reading Is Fundamental! The Starlit Kingdom — Anna Kreider's game of tragic stories about the war between Earth and Moon. Mystical: Kingdom of Monsters — a Pathfinder supplement featuring the Monster Trainer class. Sparks — Magical girls fighting the forces of Darkness! Teenagers From Outer Space — R.Talsorian Games' classic tribute to Urusei Yatsura! Tenra Bansho Zero — the legendary game of techno-Sengoku drama, and well worth the price of admission on its own! OVA Revised — the go-to game for customisable anime roleplaying (despite my efforts, PowerFrame has not been able to claim that title!). The Ruined Empire — Anna Kreider returns with a saga of warring nations originally written for Tenra Bansho Zero. Kagegami High — Ewen Cluney's game of bizarre high-school occurrences. Classroom Deathmatch — a brutal Battle Royale simulator where, let's face it, the odds are never in your favour. Keep an eye out for future news and developments! I'm really not much of an economics guy. Seriously. 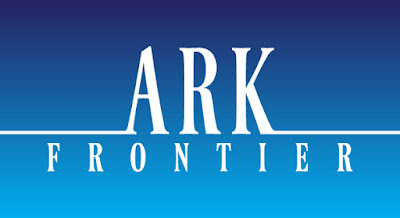 But a few days ago I started thinking about money in Ark Frontier, a society with thousands of refugees stuck on board a sealed ark-ship for nearly two decades. Here's what I came up with. Oh, by the way, I've come up with a name for the world: Arat. The two native intelligent species, the vaion and the raxene, are collectively referred to as the Aratene. The Ark was designed to become a self-sufficient arcology city, able to indefinitely support nearly 50,000 people. So the day-to-day needs of everyone on board can be met with only a little effort in production, maintenance, and distribution. Even with the population growing since the doors closed, there's little danger of exceeding the Ark's capacity for quite some time. Everyone on-board receives a basic ration of essentials, has quarters assigned, and receives a small basic income of credits, the currency used by the human colonists. Those who perform additional services (maintenance, making and selling goods, policing, government, and so on) receive extra credits. Of course, the reason credits are the basic currency is because the Ark turned up and saved people from the teeth of a worldwide apocalypse. When the Aratene came onboard, most of them had only the clothes on their backs, and only a few had decided to grab their life-savings in the face of imminent death. This means that the supply of gold pieces on the Ark is severely limited, which has inflated their value considerably. In addition, it's an unofficial currency mostly used by the underworld and the black market. Now, all of that is about to change, as the Ark's doors are finally opened. While the Ark will continue to subsidise and support the colonists as settlements are established and life returns to normal, as the settlers become self-sufficient that support will be rolled back, allowing the Ark's resources to be saved for emergencies or used where they are most needed for the overall benefit of the colony. Perhaps more importantly, as gold pieces are recovered from the ruined settlements and cities now devoid of life, the shadow economy will be rocked as the market is flooded with gold coins. I can see this having several effects. The relative value of gold will begin to drop. By the time gold returns as a standard currency, it'll likely be worth a tenth of its former value. Crime bosses, whose wealth currently comes from gold and a captive population, will need to react quickly if they want to maintain their hold on power. They'll need to send teams out to secure gold before someone else finds it, meaning some of the first registered Blazer teams may actually represent criminal syndicates. This will likely result in the frontier becoming treacherous and lawless, and bandits who can look after themselves in the Phantom-infested wilderness may become a real problem. What do decent folks think about recovering gold from ruined cities — cities occupied by their kin only eighteen years earlier? Is it pragmatic, or grave-robbing? I can see strong opinions forming here, although the naysayers are likely to be powerless in the face of economic reality. Some people are going to be driven to collect the coins, and once they enter circulation there's not much you can do. It also gives Blazer teams the chance to amass a lot of wealth, if they're willing to overlook the moral concerns. Will adventurers become the nouveau riche? The more I dig around, the more details I uncover. I can feel Arat coming into focus... although it's still a land in flux. I'm actually planning to detail several potential points in the colony's timeline, to plot a sort of road-map for the colony's likely development and also provide additional game launch-points. But that's a topic for another post. I've been working on a couple of world map projects this week, which has me thinking about mapping as literal world-building. I've been commissioned to create the world map for +Nathaniel Robinson's Kung Foo City based on his rough draft, and I've also started putting together the map for Ark Frontier. I've always enjoyed drawing world maps. It becomes a sort of meditative exercise, where I virtually wander the world, thinking about the landscape and putting myself on the ground as I carve out coastlines, raise up mountains, plot the courses of rivers, cast swathes of desert and forest. As I go, I'll discover hidden places, little nooks and secluded vales, remote islands, and long-forgotten cities. I find out who lives in these places, and what they're like, or what they used to be like. The ideas I already have in mind not only take form, but expand and suggest new possibilities. Mapping is a form of storytelling. This is particularly true with Ark Frontier, where the default campaign will start with a tiny known area at the centre of the map. As the players (and the rest of the settlers) uncover more of the world, they also encounter new challenges and learn about the disaster that almost destroyed civilisation. By taking that into consideration, the map I design will influence how those developments and discoveries play out. To some extent, it's a bit like a game of Final Fantasy, where you're initially funnelled through a linear experience, then gain access to the world map but are still limited by mountains and coastlines, then finally unlock an airship that lets you go anywhere you want. Ark Frontier starts you at the world map stage (and you can climb the mountains if you're dedicated enough), but it's no surprise that the Final Fantasy series is one of my inspirations for the setting. I'm dedicated to nonlinear exploration though, so there aren't any literal restrictions on where the characters can go, but some areas will naturally be more difficult than others. Creature design also plays a part in that, as there are a lot of different monsters that require a range of tactics to overcome, but that's a subject for another post. The Kung Foo City map is a bit of a different beast, since I didn't have to design the layout. However I still find myself walking the mountain-ranges as I draw them, and I've been trying to impart a unique character to different areas. The mountains of the north are lofty and jagged, while those of the fertile southeast rise in sugarloafs from the flat plains. To the west, the desert wastes are dotted with mesas and steep-sided plateaus. I'm pursuing a similar technique with the major cities, drawing unique and flavourful icons for each. Here's the map the players will start with in Ark Frontier. Can you feel the pull of distant horizons?